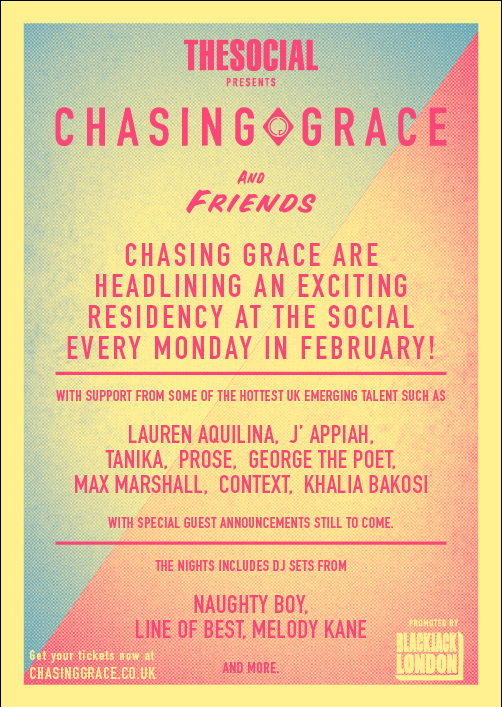 Exciting news for fans of Chasing Grace - they will be headlining at The Social in London every Monday in February. Chasing Grace's month long residency will see them get support from some of the best new artists to come out in 2014. ‘Chasing Grace and Friends’ kicks off today (3rd February) with 20-year-old Phil Plested and 18-year-old Grace Ackerman headlinging all Mondays in February at the central London underground basement venue. Naughty Boy is confirmed to DJ on the 10th February, and Chasing Grace will receive support from the likes of George The Poet, Tanika, Lauren Aquilina, Max Marshall, J.Appiah, Ava Stokes, Prose, Kahlia Bakosi and more to be announced. This event is for over 18's only, and no refunds will be issued to under 18's. Monday 3 February: Chasing Grace, Lauren Aquilina, Prose plus line of best fit DJ's. Tickets are £5 per show (limited to 2 per person), and there is also an exclusive AAA season pass bundle. A limited number of the bundle packages are on sale for £20 and guarantees you entry to ALL 4 shows! On top of that's you'll get a limited ‘Chasing Grace and Friends’ poster and a AAA Lanyard. To buy individual tickets for the show click HERE and to purchase the bundle click HERE.